You'll be £19.99 closer to your next £10.00 credit when you purchase August 1914. What's this? The great retreat of the British Expeditionary Force from Mons in August 1914 is one of the most famous in military history, and it is justly celebrated. But not all the British soldiers who were forced back by the German offensive performed well. Two colonels, Elkington and Mainwaring, tried to surrender rather than fight on, and were disgraced. This is their story. It is one of the least glorious and most revealing episodes in the record of the British Army during the conflict on the Western Front. In this compelling account John Hutton shows, in graphic detail, the full confusion of the retreat, and the dire mental state to which brave men can be reduced by extreme stress, uncertainty and fatigue. But he also describes how Elkington redeemed himself. He joined the French Foreign Legion, fought gallantly, was severely wounded and was reinstated by King George V. His is one of the more remarkable stories to come out of the Great War, as is the story of the attempted surrender at St Quentin itself. This is an extremely worthwhile addition to any collection of works about the BEF in the early stages of the war. Highly recommended. Promotion to high command is a mixed blessing. It brings with it many advantages, enough to persuade most ho are offered it to accept such an appointment. It also brings responsibility, and in the case of those who command in the armed forces, the responsibility for the lives of the men under them, the honour of the corps to which they are attached, and of the country which they serve. The obligations are not always compatible, as lieutenant colonels Mainwaring and Elkington found to their misfortune in August 1914. It was in that month of 1914 that the BEF encountered the Imperial German Army for the first time and, being overwhelmed by the forces opposing it, began its famous fighting retreat from Mons. The British withdrew to Le Cateau where Sir Horace Smith-Dorrien, in command of the British II Corps, stopped and fought a successful rearguard action. It was here that Mainwaring's 2nd Battalion Royal Dublin Fusiliers and Elkington's 1st Battalion Royal Warwickshire Regiment went into action. As part of 10 Brigade, these two battalions fought well at Le Cateau and Mainwaring and Elkington, often out of contact with their brigade commander, showed themselves to be competent leaders. Neverthesless, Smith-Dorrien was compelled to continue the retreat. 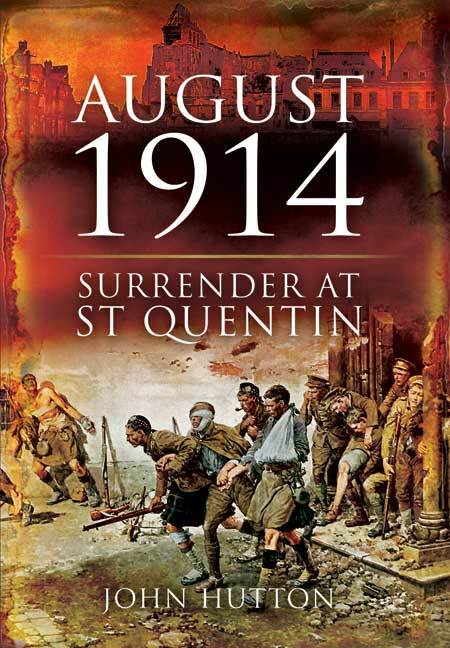 The British force duly withdrew to St Quentin throughout the night of 26/27 August. In the fighting at Le Cateau, Mainwaring's and Elikington's battles had become separated; they had no knowledge of the proper line retreat and precious little ammunition. Confusion reigned. The troops staggered into St. Quentin at the limit of their physical endurance. As far as the two colonels were concerned they were at the rear of the British Army, though in fact there was a cavalry detachment between them and the Germans. Upon arriving at St. Quentin, Mainwaring was met by an excitable mayor who "threw up in his hands, and exclaiming it was the end, all was lost". An interpreter explained to Mainwaring that the town was surrounded by Germans. The fear expressed was that the Germans, seeing British troops in the town, would start shelling. So Mainwaring made the following promise: "You need not fear, if we cannot get our men away, we will not fight in the town." Mainwaring and Elkington discussed the situation they were in. Should they attempt to break out with their exhausted troops, try and mount some kind of defence on the edge of the town with their limited supplied of ammunition or simply throw in the towel? The two commanders spoke to their men. Though Mainwaring propsed to try and march on to Noyon, some twenty-five miles away, he stated that no-one offered to join him in this move. So the decision was made by Mainwaring and Elkington to surrender. Mainwaring informed the mayor of this and even signed a hastily-prepared document of surrender for the mayor to take to the Germans. That was the situation when Mayor Tom Bridges rode into St. Quentin at the head of the 4th Dragoon Guards. Bridges knew that the Germans had not in fact surrounded the town and that there was still time for the infantry to escape. Bridges managed to persuade Mainwaring's battalions to get back on their feet and they marched out of St. Quentin. A few days later Mainwaring and Elkington, who thought they were doing the right thing in trying to save the lives of their men and of the French civilians, were arrested to face a court martial. Such are the responsibilities of high command. Congratulations John Hutton, a great story. this book tells the story of the retreat from Mons in 1914, and of two senior officers, Lieutenant-Colonels Mainwaring and Elkington, who led their men into action at Le Cateau, then through the long, chaotic, and exhausting retreat that followed. At St Quentin, when they were apparently trapped, they chose to surrender. Other officers intervened and the men were marched to safety. The two colonels were court-martialled and cashiered. This as to be one of the most remarkable stories of the early stages of the war and as such deserves to be read. This is a history of a notorious episode during the retreat of the British Expeditionary Force from Mons all the way down to the Marne and beyond in late August 1914. It concerns elements of the 1st Royal Warwickshire Regiment and the 2nd Royal Dublin Fusiliers of 10th Infantry Brigade (4th Division), who dragged themselves, bewildered and exhausted, into the town of St Quentin after managing to get away from the battle at Le Cateau on 26 August. Their commanding officers Lieutenant Colonels John Elkington and Arthur Mainwaring, in the belief that the town was now surrounded by Germans, that their men were in no fit state to move any further and wishing to avoid casualties to the civilian population, arranged with the mayor to surrender their force. They were unaware that a British cavalry screen stood between them and the enemy, and the energy and determination for the troops not be given up came from the cavalry in the shape of Major Tom Bridges of 4th Dragoon Guards. The dreadfully weary Warwicks and Dubs were persuaded to resume their retreat: Elkington and Mainwaring were subsequently court-martialed; cleared of cowardice but cashiered out of the service. The story has often been told, not least in two very good and relatively modern books: Peter Scott's "The Colonel's surrender at St Quentin" and John Ashby's "Seek glory, now keep glory". Both of them and John Hutton's volume suffer from the limited existence of the original sources concerning the incident. The court martial record and the surrender document, both vital pieces of evidence, are absent, forcing all of the authors to rely on the three protagonists own versions and upon secondary sources. John Hutton has made use of the sound recording archive at the Imperial War museum, but none of the clips quoted actually cover the vital moments in St Quentin. As such, the three versions pretty much rely on the same evidence and it is only the author's own interpretation of events that distinguishes them. John Hutton takes an even-handed and sympathetic view, recognising the enormous strains placed upon the officers and the fog of war that both confounded intelligence and prevented communication. Overall, we are given a good personal background of the main players and an engaging, entertaining telling of the retreat, from the tense and desperate moments as 10th Brigade falls apart during the latter stage at Le Cateau down to the eventual withdrawal from St Quentin. Of great interest too is the description of the contrast in the lives of the two disgraced officers: Elkington went on to join the French Foreign Legion and gave valuable and courageous service; Mainwaring disappeared from public view and died without having much of a chance to address the controversies that continue to surround his role in the affair. Given that the incident had received a good deal of prior coverage and without new evidence, it is perhaps inevitable that "August 1914" does not mark a vital development in the historiography of the early period of the war. But it is a good read, well observed, and certainly worth a look. Accounts of the British Expeditionary Force in 1914 have generally followed the lead set by the British Official History in emphasising the positive aspects of the campaign and downplaying anything negative. This has had the unfortunate consequence of obscuring the genuine historical record, where triumph and calamity often followed each other in quick succession. John Hutton has written a very good account of one of the more unfortunate and strange episodes during the retreat from Mons and Le Cateau (completely ignored in the Official History). The British II Corps suffered heavy casualities at Le Cateau, and many units withdrew from the battlefield in a state of disorder. Among these were two battlions of the 4th Division, the 1/Royal Warwickshire Regiment and the 2/Royal Dublin Fusiliers, commanded by Lieutenant-Colonels John Elkington and Arthur Mainwaring, respectively. Although some soldiers had become detached as they fell back from Le Cateau, the nucleus of the two battalions withdrew towards St Quentin in the hope of continuing the retreat by rail . Having reached the twon, the exhausted and increasingly demoralised troops discovered that all trains had left. They also came across stragglers from other units in a decidely mutinous mood, whose attitudes undoubtedly affected the men of the Warwicks and Dubin Fusiliers who now refused to move. In desperation, the two battalion commanders asked the local mayor for assistance, but fearful of German retribution he demanded that they either leave the two immediately or sign a document of surrender. Elkington and Mainwaring erroneously believed the Germans were on the outskirts of St Quentin, and unbalanced by lack of sleep and the drama of events they signed the document. Fortunately, for the British, Major Tom Bridges - a cavalry officer commanding one of the rearguards - managed to secure the surrender document from the mayor, and after much effort, he eventually rounded up the British troops in St Quentin and persuaded them to continue the march south to safety. A few days later Elkington and Mainwaring were court martialled for their part in the affair, and although the threat of the firing squad hung over them they were cashiered from the Army in disgrace. This well-researched book tells the story of the St Quentin 'surrender' with clarity and insight, and with compassion for the two officers who had been so overwhelmed by the shock of battle. Given the author's legal background, it is little surprise that the narrative of the court proceedings against the defendants is particularly well presented. While Mainwaring retired into obscurity, there was an unusual coda to Elkington's story. In early 1915, at the advanced age of 48, he enlisted in the French Foreign Legion and served bravely as a private soldier in the bloody Champagne battle in September 1915, where he was badly wounded. When news of his exploits spread to Britain, he was reinstated to his former rank by George V - his error of judgement redeemed by personal bravery.